WHEELING, W.Va. — There are many ways to get from playing high school hockey in Western Pennsylvania to the professional ranks. Some players play juniors in Canada. Others play American juniors and head to college. 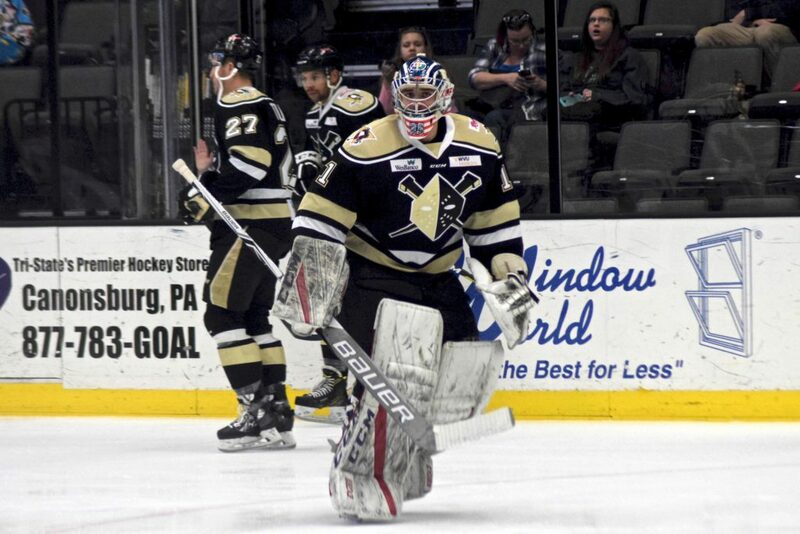 Then there’s 23-year-old Wheeling Nailers goaltender William King. When King joined the Nailers at the beginning of the 2017-18 season, he made that step that so many young players dream about, and did it in the organization of the Pittsburgh Penguins, the team he grew up cheering for as kid. But the way he earned his shot is all his own. King, a Valencia native, started his trek to the professional ranks in earnest by attending Shady Side Academy from 2010-12. But King was far from a breakout star while playing in the prep ranks. Even as a senior, King evenly split time with fellow netminder Alec Hardman. King was not a top prospect coming out of high school. Robert Morris Division I head coach Derek Schooley said he couldn’t even recall seeing him play. Clearly, King was going to have to have to take a different path. After graduation was when King started the really unique part of his journey. Will King’s North American stops on his journey. King never made it to the QMJHL. He played a few preseason games before being cut by the Cataractes, which ruined any chance of him playing college hockey thanks to NCAA rules. But his unique path did take him to Quebec, where he started at the Junior-A level, or AAA, as it is called in Quebec. In 2012-13, King played four games with the La Tuque Loups, while a mid-season transfer to the Vaudreuil-Dorion Mustangs allowed him to play 18 more games during his first year. King had an .855 save percentage and a 5.71 goals-against avenge with the Mustangs, so is inability to secure a promotion to “The Q” was far from a surprise. From Quebec, King’s journey took him farther east, to the Canadian Maritimes, where he played for the three teams over two seasons in the Maritime Junior-A league. There, King found his first taste of upper-level success. He received the MJAHL’s top goaltender award in 2014-15 whlile posting a league-best .925 save percentage. But he was still a nomad, moving from Woodstock to Valley to Campbellton in that league with stops in the Central Canadian Hockey League and Northern Ontario Junior Hockey League sprinkled in for good measure. It was during his stint in the CCHL that he played for the Nepean Raiders and general manager Randy Watt. Watt liked what he saw in King enough to give him a spot on the team — and a spot on his living room couch, as King stayed with Watt’s family while he was in Nepean. King left Nepean because it was his final season of junior hockey and hadn’t locked down a starting role, so he returned to the maritimes. The young goaltender that took over for King in the Nepean net that season was current Robert Morris starter Francis Marotte. At the end of that season, with his junior eligibility exhausted, King headed farther east. In fact, he went all the way across the Atlantic. King spent the next two years learning the European style of the game in Sweden. King was far from a hot commodity in the professional realm. When he went to Sweden, the fact that the Swedish national team is known as Tre Kronor — three crowns — and that Sweden’s most famous goaltending export, Henrik Lundqvist, is nicknamed “King Henrik” didn’t help King get any preferential treatment. He didn’t sign with Djurgårdens or HV71 or any of the other Swedish Hockey League teams that have produced so many talented NHL goaltenders. It wasn’t in the second-tier HockeyAllsvenskan league, either, which is still one of the top-rated leagues in Europe. No, King signed in the third-tier Hockeyettan, a regional league with teams in tiny towns like Kallinge, a town near the southeast coast of Sweden with about 4,500 people. That’s where King was first introduced to the European brand of hockey, playing as a professional and started to hone his craft from a talented junior to someone that could make an impact at the next level. While playing hockey overseas came with its trials and tribulations, not to mention a the cultural differences, King excelled. After posting a .909 save percentage with Kallinge/Ronneby IF in 2015-16, he moved to Tyringe, another small town in the interior of Sweden. There, he posted even better numbers, with a .915 save percentage and a 2.57 goals-against average. But he didn’t even get half of his team’s starts despite better numbers than his Swedish counterparts. After leaving Tyringe in January of 2017 due to lack of playing time, King trained back home in Pittsburgh, waiting for the next step in his journey. When the goaltender who traveled around the world received his next opportunity, it came from right around the corner. King was contacted by the Penguins and offered a spot as a goaltender in training camp with their AHL affiliate in Wilkes-Barre/Scranton. With Matt Murray, Antti Niemi, Tristan Jarry, Casey DeSmith and Sean Maguire in camp with the Penguins and there only being six spots for a goaltender in the three-tiered organization, it wasn’t exactly a guaranteed big break. King was cut from Wilkes-Barre’s camp and was sent to Wheeling, where he made an impression on the staff, but couldn’t beat out two-year ECHL pro Colin Stevens in training camp. But after being cut out of camp, some other pieces finally fell King’s way. On Oct. 23, the Penguins waived Niemi and recalled DeSmith to serve as Murray’s backup. The trickle-down effect meant Stevens was called up to Wilkes-Barre and Wheeling needed a backup. King got the call. It was just supposed to be on an emergency basis at first. But in the ECHL, where three games in three nights over the weekend are the norm, King got some chances. He stopped 18 of 20 in his North American pro debut in relief against Cincinnati on Nov. 3. He earned his first start on Nov. 12 and turned aside 39 of 42 in a 5-3 Nailers victory over the Norfolk Admirals. But even with some success, his hold on a roster spot was razor thin. Then, Murray got hurt and another round of call-ups came. King signed a full ECHL contract on Nov. 30. Later, Maguire was traded for veteran Michael Leighton and then he got hurt. Even still, King spent three days on the wavier wire in early December. But he went unclaimed and landed right back in Wheeling. King has now played in 14 games for the Nailers, second-most on the team, and he’s posted a respectable 3.14 goals-against average and a .903 save percentage to go along with a 6-5-1 record. After his stint in Europe, there were some hurdles that King had to overcome, namely re-adjusting to the physical aspect of the North American game. King used the training camp and preseason as an opportunity to shake off the cobwebs and meld the lessons learned in Canada and Sweden. Confident in his ability but humbled by the opportunity, King never forgets the road that he traveled to earn it or the rarity of playing in his own backyard. Alan Saunders contributed to this story.